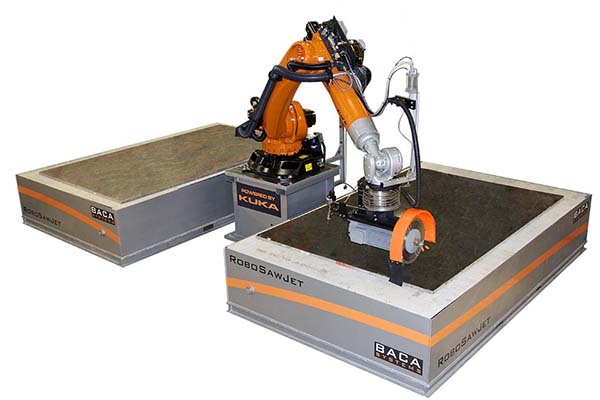 A bright shiny orange new Robo SawJet from Baca Systems is the newest addition to Natural Stone Designs’ fabrication shop. The SawJet is designed to increase efficiencies on materials and labor. It has a robotic arm that travels back and forth from the dual tables allowing us to load one table while it is cutting on the alternate table. The cutting head uses both a diamond saw blade for straight cuts and a water jet cutting head for curved cuts, as well as having vein-matching capabilities. Come visit our shop for a live demonstration. This baby can rock ‘n’ roll! This entry was posted in Uncategorized on February 17, 2015 .